The Ishara Art Foundation, the first independent institution in the region dedicated to contemporary South Asian art, is a welcome addition to the local art scene. The non-profit institution, established by Dubai-based entrepreneur, art patron and collector Smita Prabhakar in partnership with Alserkal Avenue, aims to enrich the UAE’s vibrant cultural scene with a dynamic programme of exhibitions and events designed to expand knowledge and understanding of contemporary art and artists from India, Pakistan, Sri Lanka, Bangladesh and Nepal. “Despite the large South Asian population in the UAE, art from the region is under-represented in the local art scene. I wanted to create a welcoming space where everybody can enjoy and engage with the brilliant work of emerging and established contemporary South Asian artists. Dubai has been my home for four decades, and through this initiative I want to give back to the community. The name Ishara means gesture, sign or signal in many languages spoken in this region including Hindi, Urdu, Arabic, Persian, Turkish, Bengali and Swahili. It is a gesture of inclusion, of sharing our love for contemporary South Asian art and making it a part of the cross-cultural dialogue in this region,” says Prabhakar. Ishara’s inaugural exhibition, Altered Inheritances: Home is a Foreign Place celebrates the work of leading contemporary artists Zarina Hashmi and Shilpa Gupta. It explores themes of belonging, displacement and identity that have universal resonance and have special relevance for South Asians and other expatriates that call the UAE home. New York-based Hashmi was born in Aligarh, India in 1937 and received a degree in mathematics. She is a printmaker working with intaglio, lithography, silkscreen, woodcuts and other techniques and also creates sculptures using metal, wood and paper pulp. Her work is deeply personal and inspired by her journey, memories and longing for home. She represented India at the 2011 Venice Biennale, and retrospectives of her work have been hosted by institutions such as the Guggenheim, New York. Gupta, who was born in 1976 is a multi-media artist based in Mumbai and studied sculpture at the Sir J.J. School of Fine Arts, Mumbai. She engages with the journeys of others to look at social and psychological borders and their impact on people’s lives and identities. Her work is in the collections of various international institutions. The show includes works by both artists ranging from the 1970s to the present. The artworks are poignant and profound but what makes the show truly special is the congruences Nada Raza, Ishara’s artistic director and curator of the show has found between the work of the two artists and the way she has presented it. Raza has transformed the exhibition space into a home with a courtyard and six rooms, based on the floorplan of Hashmi’s childhood home in Aligarh, which is a recurring motif in her work. In each area of this intimate setting are displayed works that highlight the similarities in the formal and conceptual approaches of the two artists and their shared interest in mapping, language and poetry, setting up an interesting inter-generational dialogue between them. The show gets its name from two key works from the Ishara collection, exhibited at the threshold (chaukhat) of this home — Altered Inheritances - 100 (Last Name) Stories, by Gupta and Home is a Foreign Place by Hashmi. Gupta’s series of 220 works documents incidents or reasons in the lives of 100 individuals that led them to change their last names. These range from escaping social, political or religious persecution, concealing or asserting identity, adapting to a new environment or aspiring to a better life. The stories are presented through metaphoric images in split frames that evoke a break with the past. 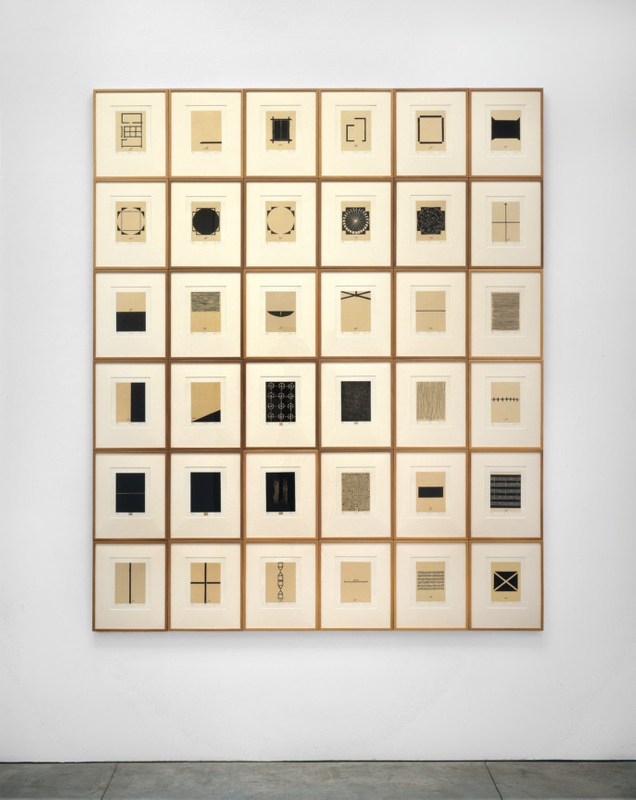 Hashmi’s iconic work, which also deals with displacement, is a series of 36 woodcuts featuring abstract pictograms that reflect a feeling, mood or memory she associates with certain Urdu words. She has depicted Home (Ghar) with the layout of her childhood home, and simply listed the 7438 miles between her Aligarh and Manhattan homes to indicate the Distance (Faasla) between her past and present. The series also includes a pictogram with a circle and square depicting the Sky (aasman), which has been adopted by the Ishara Art Foundation as its logo. The artworks in the courtyard (aangan) depict and investigate borders of various types. Hashmi has traced lines from road markings or marked the horizon where earth meets sea at various bay areas she has lived in as a gesture of acceptance of the mobility and the isolation of exile. A set of little terracotta houses on wheels from her Homes I Made series is also a metaphor for impermanence. Another set of nostalgic prints recalls her homes in various places and the special memories associated with each. Here the artist has cited verses from the poems of South Asian poets Faiz and Iqbal to express her loneliness and longing for home. Gupta’s works are based on her long-term investigation and documentation of the transitional areas around the borders of South Asia. She has used innovative ways to translate the ratios of the cartographer’s scale into tangible forms. Her engagement with poetry is in the form of bottles into which she has recited poems of resistance by various poets, preserving the powerful words for a future generation. The dialogue between the artists continues in each room. A work by Gupta featuring wrist watch hands floating like stars in a dark sky strikes up a conversation about time and infinity with a string of large gold leaf covered prayer beads (Tasbih) sculpted by Hashmi. In other works, both artists have used materials such as paper, string, cloth and gold to depict journeys across borders and the distances created by borders. While Hashmi recalls her own train journeys across pre-partition India, the directions to a childhood home that has been sold, and the trees growing in its garden, Gupta focuses on clandestine crossings across man-made borders, the informal economies operating in border areas and trees that are cherished on both sides of contested borders. 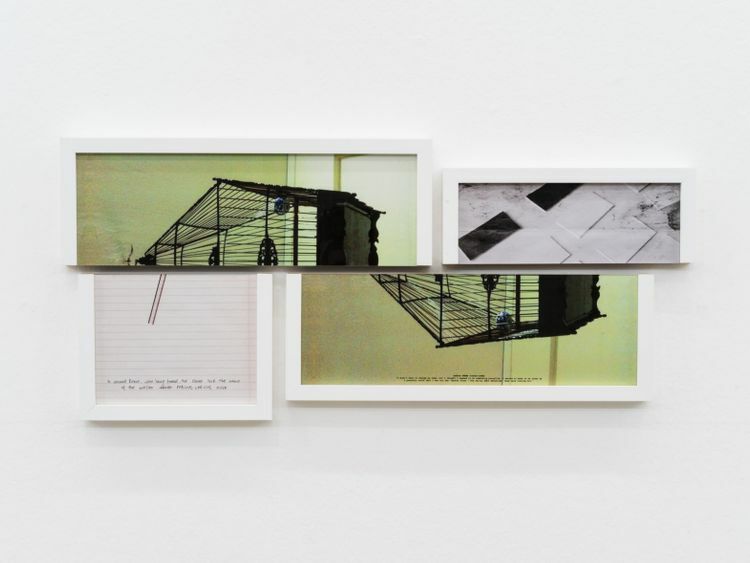 In works displayed along the boundary wall of the home both artists have used maps to explore man-made boundaries, the violence and suffering they cause and our memory and perception of national boundaries. On the upper level of the two-storey space, an entire wall is covered with 500 tin sculptures of tiny carts on wheels from Hashmi’s work, Crawling House. They are arranged like a flock of birds flying across boundaries in search of a hospitable habitat. 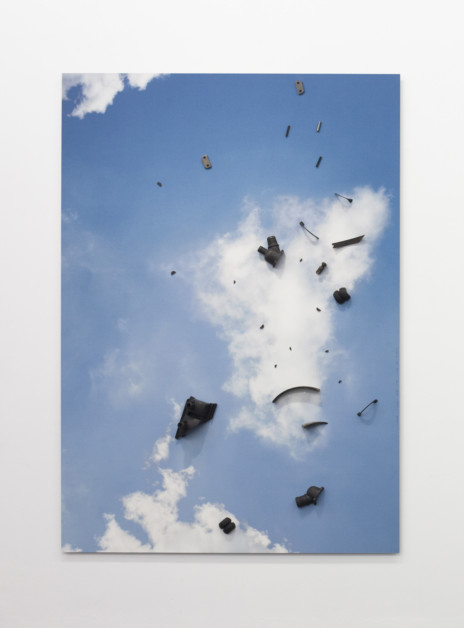 On the opposite wall is a series of images of the sky taken along various borders by Gupta on which she has glued pieces of used car parts. The work refers to goods that are smuggled across the Indian border and reassembled in Bangladesh, defying checkpoints and restrictions on cross-border trade. The final work in the show, Speaking Wall by Gupta is an interactive installation that allows visitors to experience for themselves the pathos of division. The show also includes an excerpt from Home, a film by Dutch artist Sophie Ernst where she interviewed various people who had lost their homes. Her conversation with Hashmi about her memories of her home in Aligarh poignantly fills the exhibition space with the artist’s presence. Raza, who is a well-known curator of Pakistani origin specialises in South Asian art and was previously Research Curator at the Tate Research Centre: Asia. The first exhibition she ever curated was in Dubai in 2005. “I am excited to be back in the UAE to develop Ishara’s curatorial framework. Our programme will build on the age-old links between South Asia and the Gulf and the shared histories, continued presence and cultural contribution of South Asian voices in the region. It will include works from the Ishara collection, loans, commissioned works and touring exhibitions. We want to present exhibitions that offer an in-depth look at the practices of established and emerging artists from South Asia, and we welcome people of all nationalities to come and engage with the works,” she says. Altered Inheritances: Home is a Foreign Place will run at the Ishara Art Foundation in Warehouse 3, Alserkal Avenue, until July 13.